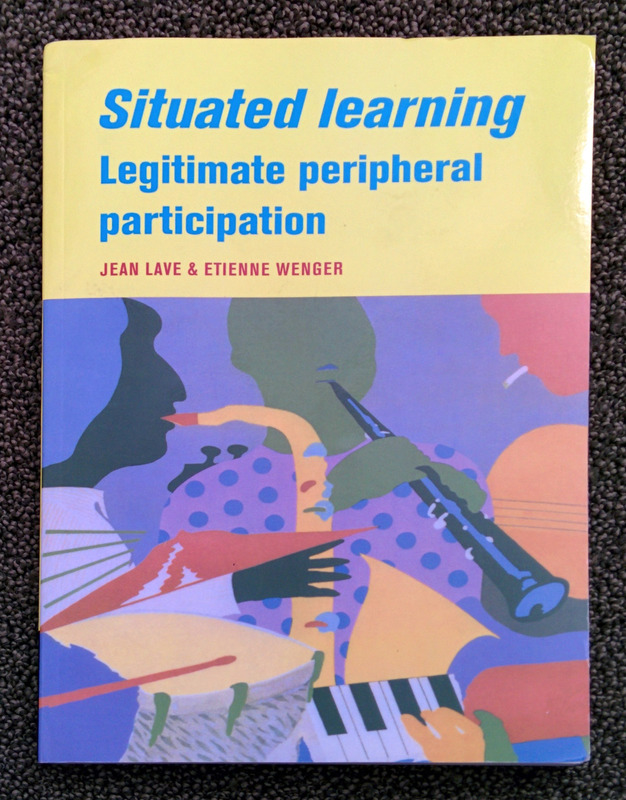 Today I devoured Situated Learning: Legitimate Peripheral Participation by Lave and Wenger (1991, ISBN 9780521423748). I read the whole thing in several hours, but I will definitely need to revisit this book again to absorb more of it. When the process of increasing participation is not the primary motivation for learning, it is often because “didactic caretakers” assume responsibility for motivating newcomers. In such circumstances, the focus of attention shifts from co-participating in practice to acting upon the person-to-be-changed. Such a shift is typical of situations, such as schooling, in which pedagogically structured content organizes learning activities. Overlooking the importance of legitimate participation by newcomers in the target practice has two related consequences. First, the identity of learners becomes an explicit object of change. When central participation is the subjective intention motivating learning, changes in cultural identity and social relations are inevitably part of the process, but learning does not have to be mediated–and distorted–through a learner’s view of “self” as object. Second, where there is no cultural identity encompassing the activity in which newcomers participate and no field of mature practice for what is being learned, exchange value replaces the use value of increasing participation. The commoditization of learning engenders a fundamental contradiction between the use and exchange values of the outcome of learning, which manifests itself in conflicts between learning to know and learning to display knowledge for evaluation. Testing in schools and trade schools (unnecessary in situations of apprenticeship learning) is perhaps the most pervasive and salient example of a way of establishing the exchange value of knowledge. Test taking then becomes a new parasitic practice, the goal of which is to increase the exchange value of learning independently of its use value. Lave and Wenger are very clear that their theory of learning “…is not itself an educational form, much less a pedagogical strategy or a teaching technique…It is an analytical viewpoint on learning, a way of understanding learning” (40). And yet, the teacher in me can’t help but grapple with the implications of these ideas on my own teaching practice and on my work with secondary school mathematics teachers. For my partial differential equations (PDEs) course, I think I first need to situate the learning by defining the relevant community of practice for the course. I think the relevant community of practice should be the set of all individuals (mostly mathematicians and scientists) who use partial differential equations to solve problems in their professional lives. Since this is an introductory PDEs course, the ultimate goal of the course should be to introduce students to this community of practice and help them to see that they can be members of this community should they want to be. The question is how to do that. Certainly I can explain this goal to my students, but to then go about teaching as usual seems to be missing the boat. Bit late here, but I always struggle with that definition of the CoP for PDEs (or applied math generally) in my context. I never feel like it is sufficiently large to justify itself as something a learner wants to be a member or or even considers usefulness of. On another note, what did you mean by your usual teaching approach missing the boat here? What I meant there was that I wonder if there is more to attending to the sociocultural aspect of teaching than just telling them that there’s this community of practice out there that they will get to know. Do you have any thoughts on that? I think these ideas are interesting with regard to subjects with many hurdles of vocabulary to overcome before you get to become a user of the subject matter. If I understand the paragraph you quoted, the ability to discuss concepts using appropriate vocabulary could be what the student exchanges for a grade. But they are not yet using the material. Learning biology in high school was like this for me. I never saw myself as part of a community of biologists – just as an outsider trying to memorize some concepts that were used by others. I’m sure some folks approach biology teaching and learning very differently. In applied mathematics I always thought of the CoP for PDEs as being compelling, so it is interesting that Dann sees it as too small. I’d like to hear more about that. I do think that in an intro PDE course, where almost everything is linear, it is important to discuss how real models can be formed in a linear framework and how many nonlinear problems are approached via linearization. But say you are a math major who would much rather live in a more symbolic, abstract corner of mathematics without connection to real world issues (because perhaps that is more attractive and compelling). Does connection to a PDE CoP work for that student?